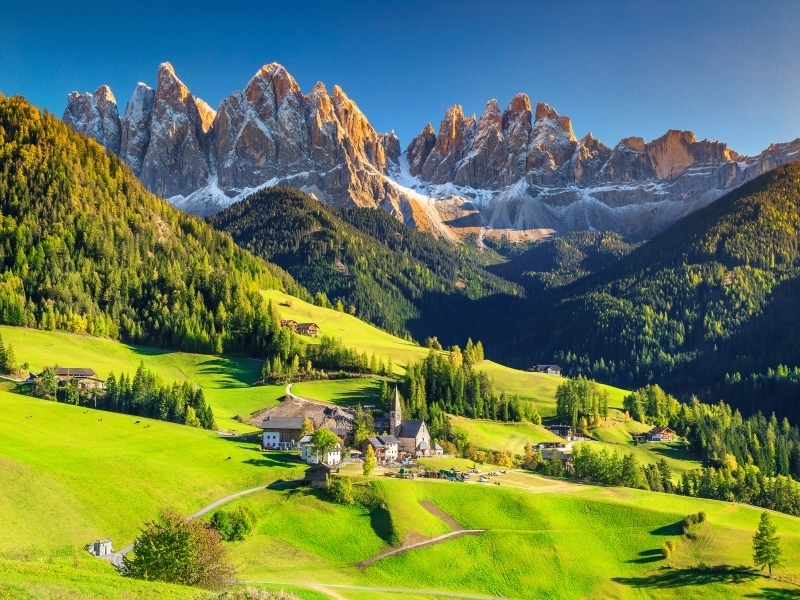 Enjoy the Little Trains of the Dolomites and discover the joys of life in the slow lane, in this part-Italian-speaking and part-German-speaking, sun-kissed region. Journey from your hotel base near the shores of ‘Italy’s most beautiful lake’, on some historic railways and cable-ways. Visit charming towns and villages that exude alpine warmth and a sense of well-being engendered by their idyllic surroundings, and enjoy some of Italy’s most delicious food and wine along the way. Flights also available from other UK airports – Bristol, Cardiff, East Midlands, Leeds Bradford, London Gatwick, London Luton, Manchester, Southampton & London Stansted – click here for more information on available dates and prices. Single supplements apply. Offer subject to availability. Fly to Italy, meet your tour manager and transfer to your chosen hotel in Molveno, set by the shores of what was named ‘Italy’s Most Beautiful Lake’ in 2017. Idyllically set in the shadow of the soaring Brenta Dolomites, a haven for nature-lovers and a climbers’ Mecca, Molveno is a perfect base from which to explore this very special region. Enjoy a first dinner in the hotel this evening. Begin your exploration with today’s visit to Bolzano, the capital of the Alto-Adige/South Tyrol region. The city captures perfectly the meld of southern Mediterranean and northern Italian influences in its famed foodstuffs and celebrated wines. Set in a broad valley at the confluence of two alpine rivers, Bolzano makes drifting into holiday mode easy; relax in countless little cafes and explore colourful shops and stores. German – and English – are widely spoken here despite this being Italy, and a leisurely lunch is more likely to consist of wurst and apfelstrudel than pizza and pasta – accompanied of course by a glass of local wine. After an introductory tour enjoy a delicious lunch, or visit the town’s South Tyrol Archaeological Museum, home to the mummified remains of Otzi, the famous Tyrolean Iceman unearthed in 1991 by two tourists. Hopefully no such startling diversions await you this afternoon as you enjoy your scenic journey, first aboard the Renon cable car to Soprabolzano, set on a sunny plateau. After a chance to take in the idyllic surroundings of the Renon Nature Park and to see the fascinating Earth Pyramids rock formations, complete the day with a ride on the historic narrow-gauge Renon railway to the mountain village of Collalbo. Today brings opportunities to savour the delights of the hotel and Molveno, with its small selection of shops and cafes, and its pristine lake, on which rowing boats are for hire. Alternatively, take the cable-car to the heights of beautiful Pradel and the Paganella plateau beyond that boasts mile upon mile of walking trails. Equally, you’re welcome to join an optional excursion to former Roman settlement Trento, the principal town of Italian Trentino, in its mountain-backed setting. Wander the colourful streets, and don’t miss the ancient Duomo cathedral or the vast Buonconsiglio Castle, or perhaps enjoy another leisurely lunch, before completing the day with a relaxing hour or so on the shores of fjord-like Lake Levico. Another historic railway awaits you today, as you head along the Weinstrasse, or wine trail, to tiny San Antonio, or St Anton, to board the Mendola funicular. Enjoy some spectacular views as you climb, at a maximum angle of 64 degrees, to the top station. After the opportunity for yet another leisurely lunch, this afternoon sees you immersed in the region’s wine-growing industry, as you visit the idyllic village of Caldaro, where the South Tyrolean Wine Museum provides a fascinating insight into the local vintages. Later, enjoy a wine-tasting in Mezzocorona, famed as ‘the most beautiful wine-growing garden of Europe’. Enjoy another free day in Molveno and its delightful surroundings, or join today’s optional excursion south to famed Lake Garda. Highlights of this tour include visits to elegant Riva del Garda on the northern shore, and colourful Malcesine, from where you can take the cable car to the heights of Monte Baldo, above the famous resort town. A last day of exploration amongst the scenic Dolomites sees you head onto the vineyard-covered Rotaliana plain to historic Mezzolombardo, which sits between two beautiful valleys, overlooked by its two castles. Board a regional train here for the scenic, 45-minute journey to Caldes, passing yet more hilltop fortresses, and upon arrival enjoy a visit to the restored 13th-century castle that dominates this tiny delightful apple-growing village. After the chance for lunch a final afternoon visit sees you step back in time as you wander the ancient rooms of the Palazzo Assessorile in the heart of the historic village of Cles, in its idyllic setting. The last day is free for rest and relaxation, hopefully to soak up the sunshine on the lake shore or on the water. Alternatively you may wish to join a final optional excursion to fair Verona, the historic backdrop for the tragic tale of Juliet and her Romeo, and home to the famous opera season held yearly in its Roman amphitheatre. Explore this fascinating place, and then take a seat in an open-air cafe in Piazza Bra to watch the world go by. Return to your hotel for a last dinner and re-live the memories of a wonderful week in this special corner of the world. Transfer back to the airport for the return flight to the UK.